1. 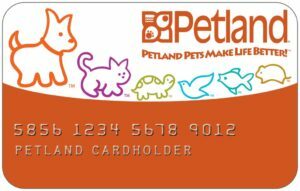 Petland Credit Card Petland Knoxville offers financing through the Petland Credit Card. To get started click the card below. Lending USA is only one of the multiple options available at Petland Knoxville that we use to finance our customers. Lending USA is a closed ended financing contract. They offer a 6 month-no interest loan option, for anywhere from 36 -60 months with low monthly payments so you can take home your pet and supplies today! 5. IGW Financing- providing financing to individuals through our approved retail dealers . Please come into the store to fill out an application . 6. Financemypet.com With FinanceMyPet.com (a service of IGW Solutions, LLC), EVERYONE IS APPROVED! We offer 3 months same as cash with 50% of the total to be paid upfront, or the remaining balance may be paid over a 9-month period with assigned interest. There is a $50.00 financing service charge to use this feature. All you need to get started is to bring in a voided check!